Lovely, lemon pudding at the bottom and a light as air cake topping. Make in individual servings or as one large pudding. 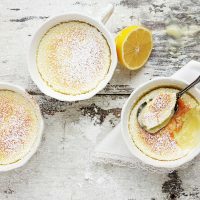 These Warm Lemon Pudding Cakes recently caught my eye and as I am a sucker for anything lemon, so I was anxious to try it. It was a bonus that I found some Meyer lemons at the store this week. That said, if it’s not Meyer lemon season, regular lemons will do just fine. Preparing this recipe involves a couple of steps. First you make the lemony pudding base, using egg yolks, lemon juice, lemon zest, sugar and a bit of flour, for thickening. Then separately, you whip up the egg whites with a bit of sugar. Both of these parts are then gently folded together. 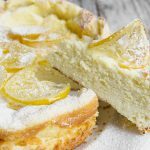 As it bakes, the creamy lemon pudding cooks on the bottom while the egg whites float to the top and cook up into a soft meringue-like “cake”. I should point out that it really isn’t cake, as we typically think of it. It’s very light. Souffle-like. I’ve offered some tips on both these things below in the Cook’s Notes! If you’re looking for a dessert that is light and not too sweet, this is a perfect choice. It would be great for finishing a special meal as the flavour is fresh, but it’s light enough to be enjoyed on top of a big meal. This pudding kept well in the fridge, without suffering much at all, if you need to make it ahead a bit. Just cover with plastic wrap once cooled, refrigerate and re-warm slightly before serving. Note: The cups that I baked my puddings in are marked as oven-safe. I wouldn’t suggest using cups that don’t clearly indicate they will be safe in the oven, as bad things could happen to them and I’d feel terrible about that. If Meyer lemons aren’t in season or available to you, regular lemons are just fine. You may wish to use a bit less lemon juice if using regular lemons. About 1/2 cup is probably about right. Separate your eggs carefully. Even the smallest amount of yolks in your whites will cause your egg whites not to whip up well. If using the same bowl for both the cake and egg whites, be sure to wash well in between. Egg whites will not whip up well if there is any grease or oil in the bowl. Always start with a squeaky clean and completely dry bowl. Any bit of water or grease in the bowl will interfere with the egg whites whipping well. Starting with fresh, room temperature egg whites is best. Once you have your perfect egg whites, be sure you don’t stir out all the wonderful lightness you just whipped in. “Folding” involves using a rubber spatula to carefully incorporate the egg whites with the batter. Since the batter is much heavier than the whites, you need to do this slowly and lightly. 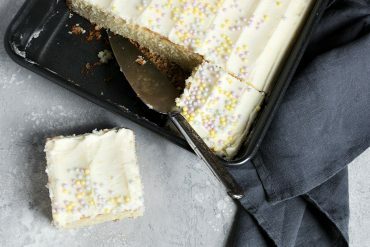 Once you’ve spooned the whites over the batter, use a rubber spatula using the following technique: Using the edge of the spatula like a blade, slice through the mixture from 12 o’clock position to 6 o’clock position. When you get to 6 o’clock, twist the spatula blade clockwise, then use it to lift some of the batter at the bottom over the egg whites. Rotate the bowl slightly and repeat this motion. Keep doing this until the whites are combined with the batter. 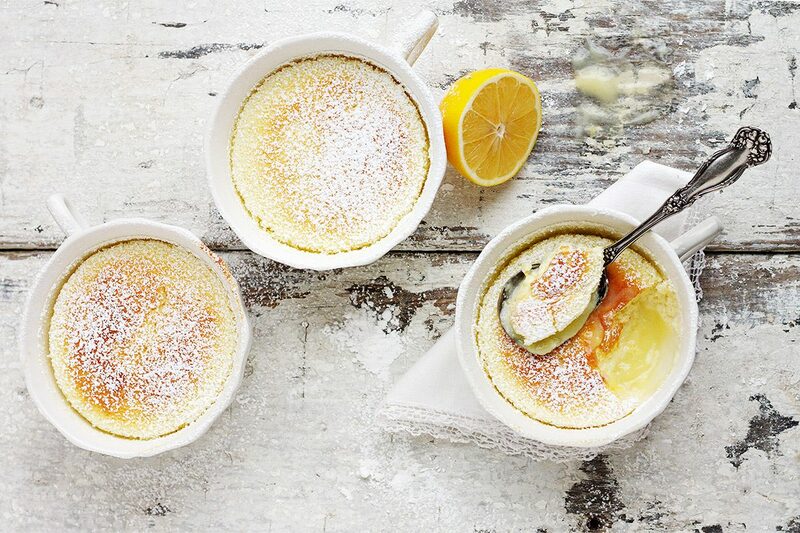 A delicious, fresh and light lemon dessert, with a creamy, warm lemon pudding on the bottom and a light souffle-like "cake" topping. A perfect meal-ender. For a lighter lemon taste, try Meyer Lemons in this one! Preheat oven to 350° F with rack in centre of the oven and lightly butter one 1.5 quart baking dish or 4-6 individual, small ramekins. Have ready a high-sided roasting pan and place the prepared dish (or dishein to the roasting pan. Bring 8-10 cups of water to a simmer (will be added to the roasting pan to bake the puddings). Separate your eggs and have ready. Set aside 2 Tbsp. of the white sugar. Add the rest of the sugar to a large bowl or the bowl of a stand mixer. Add the butter and beat (with stand mixer or electric mixeuntil mixture is grainy but light. Add the egg yolks one at a time, beating well after each addition. Add the lemon zest and mix in. Add the flour and salt and mix. Add the milk and lemon juice and mix until combined. Set aside, or if using your stand mixer, remove to a large bowl and wash your mixer bowl really well (you'll be whipping the egg whites in it next, so be sure it is squeaky clean!). In another bowl or the bowl of a stand mixer, beat your egg whites until they're frothy and beginning to form soft peaks. Sprinkle in the reserved 2 Tbsp. of white sugar and beat again until stiff peaks form. Spoon the whipped egg whites on top of the egg yolk mixture. Using a spatula, gently fold the egg whites in to the egg yolk mixture by pulling a bit of the batter up and over the egg whites. Continue working gently until the mixture is uniform in color and texture. Do not over mix, but be sure there aren't any large chunks of egg whites. Pour or ladle your batter in to the prepared dish or dishes, set in the roasting pan. Carefully pour simmering water in to the roasting pan so it comes about halfway up the sides of the baking dish. Carefully transfer the roasting pan with the water and ramekins in to the preheated 350° oven. Pudding(will bake anywhere from 30 minutes (for small, individual servingto 45 minutes (for one large pudding). Baking times will vary though, so do watch closely. You want the top to be firm and golden, but not browned. Remove the pudding from the oven and transfer baking dish or dishes to a cooling rack. Allow to cool for 10 minutes before dusting with icing/confectioners sugar. Serve warm and enjoy! A classic and perfect to bake all year round. 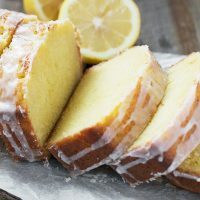 My favourite and best lemon loaf recipe! 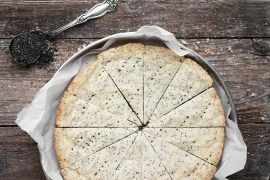 Something just a little different, this cake is super light and refreshing. 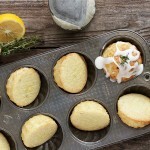 Lovely little glazed lemon cakes, with a tiny hint of thyme. These lemon dessert looks scrumptious! Can this recipe be easily doubled? I’m hosting dinner party for 12. Would love to serve this following a meal of Seafood Gumbo. Hi Dorothy. I don’t see any reason why it wouldn’t double just fine. Enjoy! I made this for the first time. It came out perfect and it was delicious. It’s good either hot or cold. Thank you for sharing this recipe. So glad you enjoyed these :) Thanks! Thanks for this lovely recipe. I tried this evening and the puddings turned out beautifully. Too many limes in the garden this year, I managed to use over ripen limes to substitute lemons and the taste and texture were fantastic good. Well done!!! Wow! I was curious how a one liquid mix could turn into two distinct layers, but it did!! And is delicious! Pudding and a light cake, just as promised. Definitely making this one again! I’m going to make these for Christmas dessert and I can’t wait – my husband LOVES lemon desserts. I am totally in love with your cup dishes – where did you find oven save coffee cups? It doesn’t say how ugh lemon juice? Hi Maureen, Sorry, I recently converted some recipes to a new system and that ingredient disappeared. I have added/fixed it now. Thanks for the heads up!! Omg … beautiful pictures , one of the best blogs for sure . This looks so pretty and sounds delicious! This recipe is an old family favorite that my mom copied from a local tv show when I was maybe 10 or 11 ( I am 67 now) . I have made it many times over the last 47 years but not in ramekins – either in a shallow casserole or a souffle dish. This is very close to my recipe except mine calls for 4 eggs. My husband and daughter nicknamed it “The Lemon Thing” and it is a favorite with them as well as my daughter’s friends. After reading this recipe, I am interested in trying it in ramekins. I usually get it all together and pop it in the oven before we sit down to dinner so it is just right when it is dessert time. It is good cold too. Some things I have learned along the way : (1) be sure your egg whites are at room temp before you whip them (kitchen rule: Whipping Cream = COLD Meringue = room temp) (2) I usually put the salt in the egg whites and add a little cream of tarter because it stabilizes the meringue and makes really good peaks. (3) I have actually made the batter in the food processor or blender then folded it into the meringue It still works. (4) if you make it in a 2 quart Pyrex casserole the cake topping is a bit denser and thinner. If you use a deep dish like the one I use which is a 3 quart souffle dish you get a souffle, with the light as a cloud sponge topping and the luscious creamy sauce under it. It is like two totally different desserts. (5) I prefer to make meringue with a hand electric mixer. that is just my preference which frees up the stand mixer for the batter. This looks so amazing! That texture is perfect and I love that they’re in tea cups! So cute! For those of you that entertain large-scale on a regular basis: these freeze fine. I made ahead and put them in the freezer. they defrost and heat up equally well in oven or microwave. My only trouble with the recipe is that the tops browned to much before the cooking time was finished so had to cover with foil to prevent the cake-like part burning before the pudding part had finished cooking. Thanks Rain. That’s good to know about the freezing! Great for making ahead. Made this last Friday and was slightly surprised at how it turned out, but now that I go back and actually read the post I realize we got it just right… Only our molds were just a little bit too small so some of the pudding ended up in the bain-marie… Oh well, tasty nonetheless! my oven’s cooking time is incredibly short when the fan mode is selected. Should I select the fan mode or reduce the heat ? thanking you in advance for the answer. Hi Vildan, I’m sorry, but I have absolutely no experience with fan assisted ovens, so I have no idea. Thank you so much for reply. I’ll try it any way cause it looks perfect. I’m wondering whether to use plain flour or self raising flour in this recipe. Pls can you help? They look delicious and I’d like to try them for a party on Friday. Hi Liz, You should use plain flour. I have served this warm and chilled and everyone – husband, friends, kids etc., all liked it best cold. I serve it with mix berries. Sometimes I also make your Hot Chocolate Pudding Cake and serve them so that everyone can choose to go light, chocolatey or take a little of both- the latter is the choice of many. That has been a big hit and perfect as I have friends who don’t like chocolate (can’t imagine!) but love lemon. I actually like them cold, too … but, I’m always a sucker for warm lemon anything :) I LOVE your idea of serving both the chocolate and the lemon. I would have a hard time choosing between the two. I’d have to have both! Hi Zahra, Yes, I did bake mine in cups BUT, they are specifically labeled as “Oven Proof”. I don’t believe regular porcelain mugs would be safe in the oven. Sounds amazing! Can I store the already prepared batter in the fridge for a few hours before I bake it? 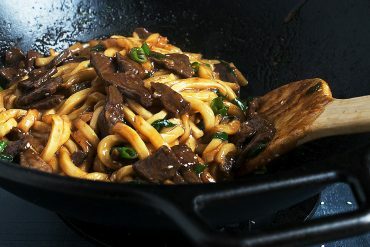 I want to serve it at a dinner party but want to be able to prepare it ahead of time? Hi Rula, I’ve never done it, so I’d hate to advise you that it would work, especially for a dinner party. You can definitely bake them ahead and refrigerate, then re-warm (covered with foil) in the oven or microwave, though. These look amazing! I love lemon! Eating this right now! Came out perfect, thank you for the recipe. 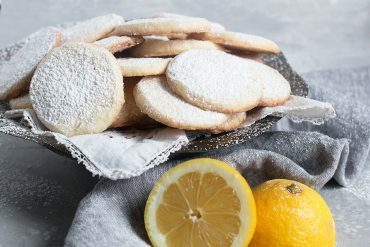 I just harvested the lemons from the Meyer lemon tree I have growing in a pot indoors and came across this recipe when searching for ways to use them. This recipe is delicious! Very light and lemony. This recipe is a keeper. Thanks! 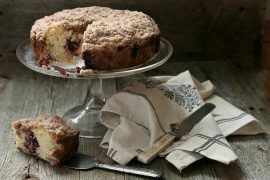 Thank you for such a wonderful dessert recipe; I covered this in my a to z USA challenge, absolutely beautiful! Thanks so much, Robert and so glad you enjoyed them. One of my favourites! I just made these tonight and they were delicious, My husband loved it! I used four 3/4cup ramekins and they took about 15 minutes to cook. Thanks for the lovely dessert. I’ve made this twice now and I think this is delicious. The only problem is that I can’t seem to make the right consistency of the pudding on the bottom. In my last attempt it turned into something like a simple syrup and I can’t understand why. 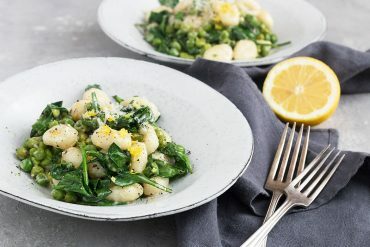 This is my first attempt to try to make a dish like this so I was wondering, do you have any tips on how to avoid this? Hi Shaun, If you pudding isn’t thick on the bottom, I’d look to the mixing of the butter and egg yolks. Not sure what you’re using to mix, but I’d try mixing longer. Be sure to do the butter/sugar for 2-3 minutes, at least, and then beat well after each egg addition. See if that helps. Hi Pat. Oh yes. It’s a pudding cake, so it has pudding on the bottom. I had only two eggs so I kinda meddled with the measurements but goddamn bloody hell. So glad you enjoyed it and good job meddling with the ingredients! Recently I was given some fresh Meyer Lemons direct from California and had no idea what to do with them. A Google search “what to do with Meyer Lemons” led to someone’s PInterest page which included a link to your website. I made nine little ramekins tonight and have already eaten three! 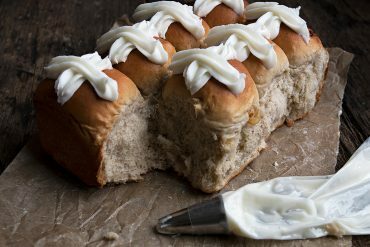 Plus, I have enough lemons left to make your sweet pull-apart rolls – tomorrow’s agenda! 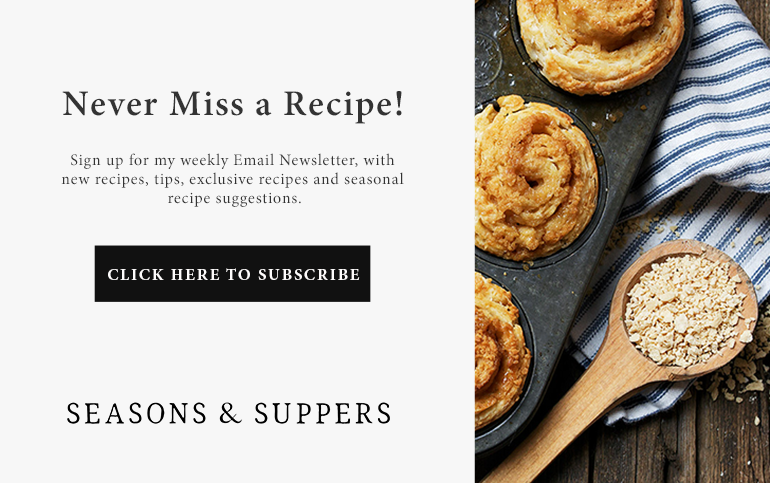 I am totally impressed with your website and all of your recipes and shall definitely be following you regularly. Thanks so much! So glad you enjoyed the puddings and I know you will love the pull-apart bread. I just made me this tonight and I was worried it was too runny (before being baked, obvs), but it baked up perfectly! It really was a delicious, tart pudding cake! So glad you enjoyed it, Erika. Hi- do you think this can be made with soymilk? Hi Elianna. I have to be honest and say I have no idea. My gut tells me it probably would work ok, but not sure how soy milk reacts having never used it myself. Maybe someone else might come along and weigh in. I made this pudding two nights back. It was absolutely delicious! I love lemon desserts. This pudding had the perfect combination of lemony tang, sweetness, and “airiness” (probably from the egg whites right?)! We made this last night, in 4-oz. mason jars, which made 11 servings. So cute! And they only needed about 15 minutes to bake. First bite: rendered speechless! YUM! Thanks for the update Jana. I love the mason jar idea and I think the 4oz. size is perfect for small dessert treats. Glad you enjoyed them. Do you think these could be baked in little mason jars? Any idea if you’d need to adjust the baking time? I think they could be, Jana. I have baked in mason jars, so that part shouldn’t be an issue. As for baking time, if they are the little 4oz. ones, time would be a little less. If 8oz. or so, about the same as my tea cups (which took 15 minutes). Make sure to only fill about 3/4 full, as they do rise as they cook. Let me know how it works out! Oops, that would be 30 minutes-ish for the 8oz. size (was thinking of my chocolate puddings). Again, a bit less for a smaller jar. Thank you so much, Jennifer. We so appreciate your wonderful review and your photography is incredible! You make our food look even more appealing. Thank you from the bottom of our hearts! Your stunning photos caught my eye and these cups are simply adorable. 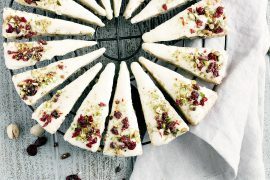 Would be perfect for a no fuss festive dessert! Thanks so much, Gintare. They would be perfect, for sure. A delicious and easy dessert. What is the brand of the little teacups? I know you said that you bought them at the Habitat for Humanity ReStore, but I was wondering if I may be able to locate them elsewhere. I’ve been on the hunt for ramekins, but these are just so much cuter! I tried these yesterday.. Absolutely amazing. So glad you enjoyed them, Fatima. This is absolutely SCRUMPTIOUS! My friend and I made this (by hand, unfortunately for our arms, but it can be done) and we loved it. Light, decadent, perfect for something sweet on a chilly winter evening. How would you recommend rewarming it? It sounds delicious! I just rewarmed in the microwave. Keep covered with plastic wrap and microwave on high for 45 seconds to a minute. Oh awesome! The texture of these is killing me. Is it sort of like that Magic Custard Cake that went around the internets this summer? That was pretty good, but this looks even more inviting :) Great photos, as usual! Thanks Sophie. I made the Magic Custard Cake a while back (couldn’t resist :). It was delicious, but this is a different kind of delicious. My first thought when I ate it the topping was that it’s like the meringue on a lemon meringue pie, only with a bit more texture (not so airy … and warm). Beautiful photo! Thinking of giving this a try — Do you think these could be made an hour ahead, then popped into the oven so they would be warm at dessert time? Thanks Pam and absolutely, you could do them an hour ahead and re-warm. They don’t have to be hot – just warm, so just a few minutes in the oven should do it if they are at room temp already. (I refrigerated my leftovers and re-warmed in the microwave a day+ later and they were just fine. This looks scrumptious! I’m gluten- and dairy-free, though, so I’m hoping I can use a g-f flour mix and almond milk and still make it work. Thanks Barbara. I think you could make this gf and dairy free, as it’s the eggs that are the critical part in this recipe. You could consider cornstarch (corn flour) for the pudding part, as well. The main role of the flour is as a thickener of the pudding, so any gf flour option that thickens well should work. Oh, good – I’m glad you think it can be done! Corn starch isn’t possible for me – I am deathly allergic to corn. But as you say, there are many g-f options! Let me know how it works out, Barbara. I will – thanks, Jennifer! Thanks so much, Renee. Believe it or not, I found these cups at the Habitat for Humanity ReStore. It’s a treasure trove of goodies! Gorgeous! It’s almost too pretty to eat! 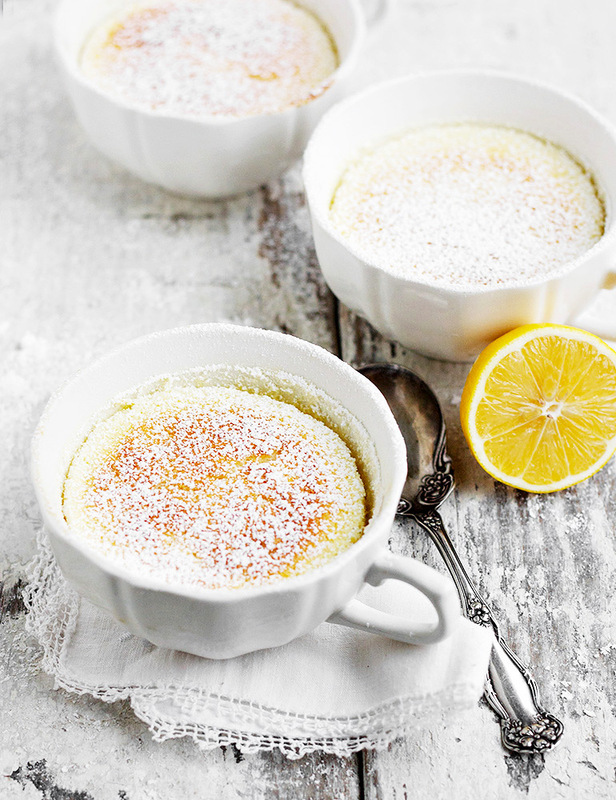 I’m a fan of lemon desserts so this pudding would be perfect for me! It looks light and delicate. You would enjoy it, for sure. It is light and lemon-y! Wow these photographs are just stunning. Beautiful work. Love the fleck of confectioners sugar all around them. Makes them look so light and gorgeous. This is a lemon-lovers treat, Liz. Hope you get a chance to try them. Delicious! You mean, you’re a *pucker* for anything lemon. Bah dum, chh. 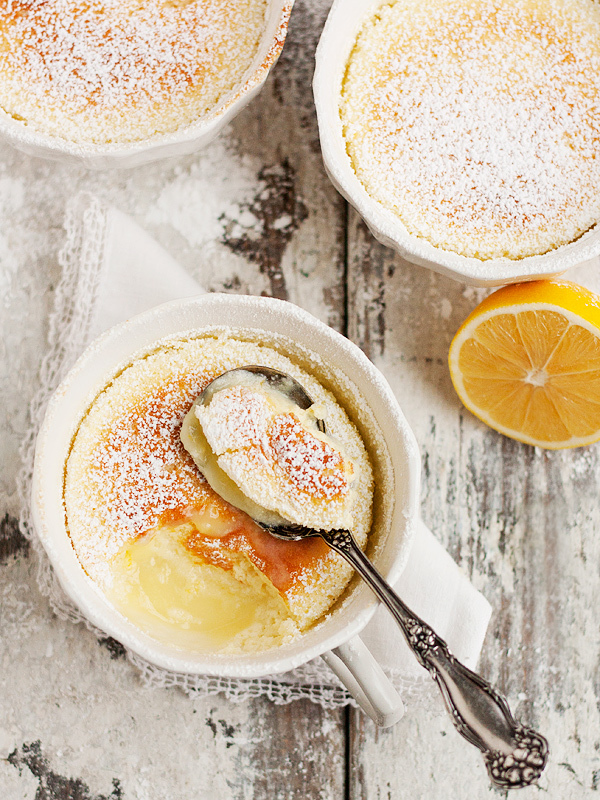 I can’t wait for my Meyer lemons to be ripe so I can try this – a beautiful and bright dessert! Thanks so much Laura. I can only dream of having Meyer lemons ripen in my yard ;) *jealous!